In the Irish countryside the true spirit of St. Patrick’s Day really lives on. 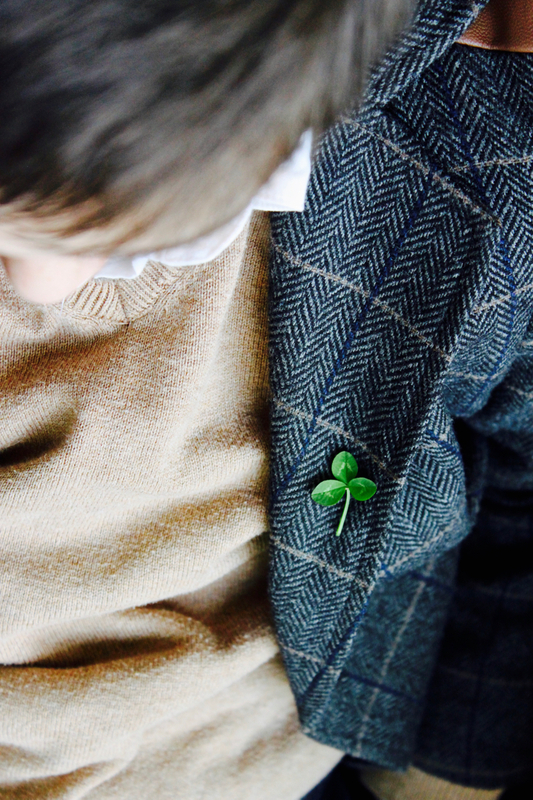 My husband and his family still pick a shamrock clover and pin it on their lapel for the day, and now I am a part of that special tradition as well. I will never forget my first St. Patrick’s Day experience after moving to Ireland. Everything in the little village nearest to us was closed on the day; the post office, the bank, a good number of shops, about the only place with open doors was the church, and I soon realized that it was not only a national holiday, but a religious one as well—though the name should have given that away. My mother-in-law invited us to the farmhouse for dinner that day, and I could hardly contain my excitement about having my first authentic Irish corned beef and cabbage! We sat down at the dinner table while Peggy brought out generous plates of roasted pork loin with mashed potatoes covered in a white creamy parsley sauce accompanied by a bit of boiled cabbage on the side. I was stunned. Where was the corned beef, and why on earth was there so little cabbage? The truth is, there really isn’t a special meal in Ireland on St. Patrick’s Day. Parades, yes. Parties filled with libations, yes. Shamrock-wearing, yes. But, food-wise, at least in rural Ireland, we all just sit down to a nice meal, which can be anything from roast pork to a T-bone steak, but never, ever, corned beef. Over the years, our Paddy’s day celebrations have evolved. 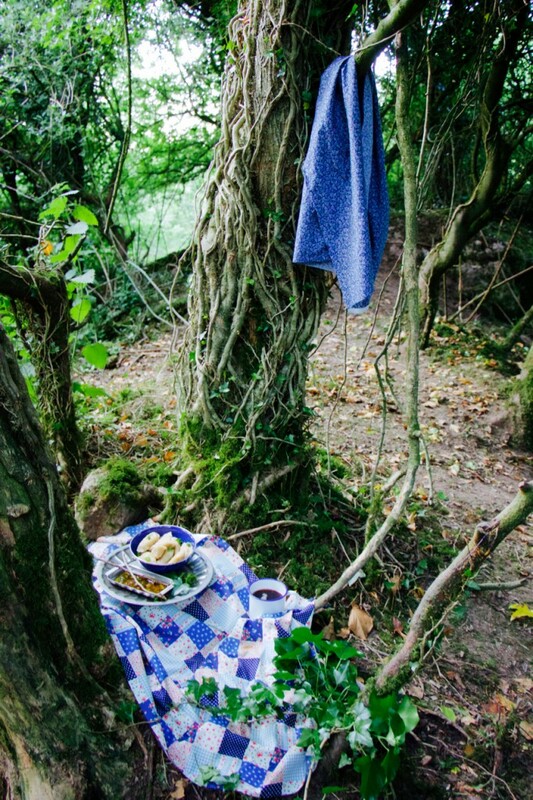 We have begun a ritual of going for a long walk on the farm and visiting the fairy fort* (a circular earthen mound-style dwelling from ancient times) for a picnic. 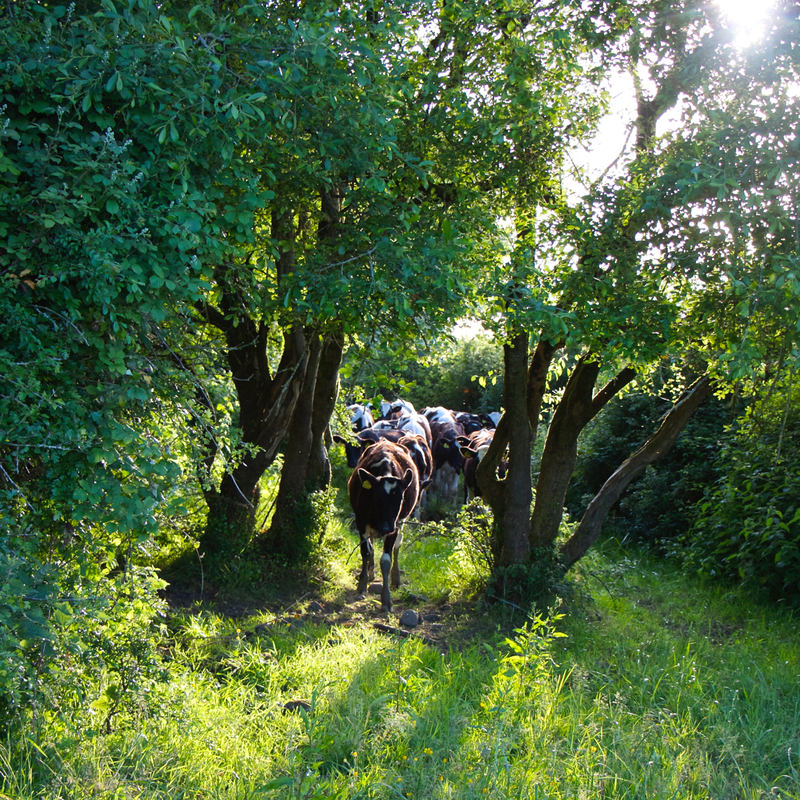 I bring all the fixings and we sit under an ivy-covered tree and nibble away, all the time being on the lookout for fairies, and heifers and calves that might be exploring the fort as well. Since I always like to try something a little different than roast bacon and cabbage, I found that it is fun to prepare an Asian-style potsticker dumpling with pork, cabbage, and parsley sauce. I borrowed the dumpling wrapper recipe from my friend, Molly Yeh, and went to town with traditional ingredients. A couple of hours later, we walked out the door with a basket of dumplings, dipping sauce, chopsticks and a flask of tea. 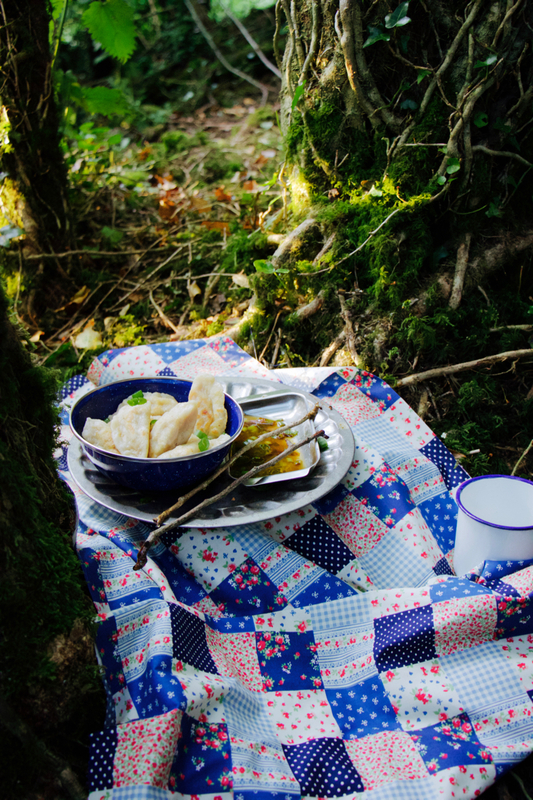 With a picnic like that, who needs corned beef and cabbage! This recipe is in my chapter entitled New Traditions in The Farmette Cookbook: Recipes and Adventures from my Life on an Irish Farm. In a medium bowl, combine flour and salt. Gradually stir in boiling water until the mixture is mealy. Gradually add the cold water and stir until the mixture turns comes together into a dough. Knead dough on a floured surface, adding more flour as necessary, until the dough becomes smooth. Transfer to a clean bowl, cover it with a damp towel, and let the dough rest while you make the filling. Make the wrappers In a medium bowl, combine flour and salt. Gradually stir in the boiling water until the mixture is mealy. Gradually add the cold water, and stir until the mixture comes together into a dough. Knead dough on a floured surface, adding more flour as necessary, until the dough becomes smooth. Transfer to a clean bowl, cover with a damp towel, and let rest while you make the filling. Make the filling Put the cabbage in a food processor and pulse until finely minced. Transfer to a large bowl and sprinkle with the salt. Let sit for 10 minutes. Pulse the ginger, parsley, ham, pepper, soy sauce, rice wine, and sesame oil to food processor to mix well. Set aside. Squeeze the water out of the cabbage and into the sink. Place the dry cabbage in a dry bowl and add the ham mixture. Fold together with your hands. Make the dumplings Roll out the dumpling dough into a circle and cut out wrappers with 4-inch round cookie cutters (or the top of a wineglass or teacup). Set aside. Mix together the cornstarch and water for the slurry in a small bowl. Take one dumpling wrapper, and spoon about 1 tablespoon of the ham mixture into the middle. Dip one finger into the slurry, and paint the edges of the dumpling wrapper. Fold the bottom side of the wrapper over the filling and press into a half-moon shape. Place on a baking sheet, cover loosely with plastic wrap, and repeat with the rest of dumplings. Make sure the dumplings do not touch each other on the sheet. When all the dumplings are assembled, you can cook immediately or cover with plastic wrap and refrigerate for up to several hours. To cook, half-fill a large pot with water and bring to boil. Gently slide in one-third of the dumplings. When the water returns to a boil, turn the heat down and simmer gently for 6 to 8 minutes. Remove with a slotted spoon, and repeat with remaining dumplings. Coat the bottom of the frying pan with oil and place over medium heat until hot. Fry dumplings until they are golden on each side. Make the dipping sauce Heat the sesame oil in a saucepan until it smokes. Add the scallions, then the brown rice wine vinegar and soy sauce. Mix well, then take off heat and pour into bowl for dipping. Scullery Notes: Salting and squeezing the water out of the cabbage is essential. It prevents dumplings from being waterlogged and soggy. *The term Faerie is derived from the Gaelic word “Fé erie”, meaning the enchantment of the Fées, while Fé is derived from Fay, which is itself derived from Fatae, or the Fates. The term originally applied to supernatural women who directed the lives of men and attended births. Now it has come to mean any supernatural creature tied to the earth, except monsters and ghosts. In Ireland, the Faeries are called the Aes Sídhe, pronounced eye-shwee) Sídhe are also the name for the earthen mounds and hills that dot the Irish landscape. 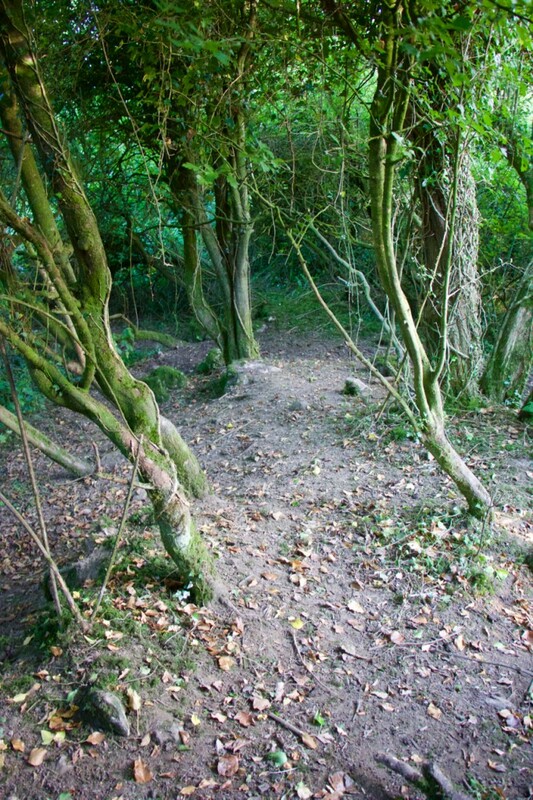 Irish mythology, legends, and folklore claim the Faeries live under these mounds, so the term sídhe has come to mean Faerie in general, but it more properly refers to the palaces, courts, halls, and residences of the Faeries. However they are known by a wide variety of euphemisms, including “the Fair Folk”, “the Good Neighbors”, “the Little Folk”, “the Little Darlings”, and “the People of Peace”. Photos by Imen McDonnell. Styling by Sonia Chaverri Mulford 2015.